AGILE methodology is a continuous iteration of development and testing. This methodology followed throughout the software development lifecycle of the project. As in the waterfall model, to develop software you have to first complete the first phase then and only then you can move to another phase. 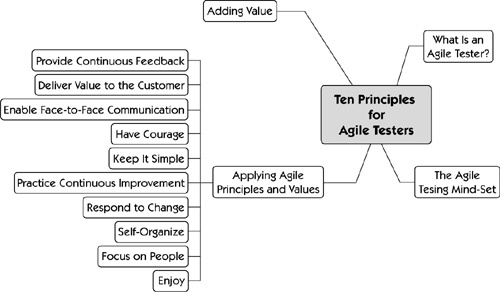 But in Agile methodology, development and the testing activities are concurrent. Now, I hope we got an idea of Agile!!! So, we can step on to Agile Testing. A software testing technique that follows the principles of Agile software development is called Agile Testing. It is an iterative development methodology. It starts at the beginning of the project with the continuous integration between the development process and testing. Agile Testing is not sequential but continuous. The agile team works as a single team to achieve a common goal that is Quality of the product. This testing has lesser time frames called iterations (It can be from 1 to 4 weeks). This methodology is also called or known as a release, or delivery driven approach. It gives a better prediction of the workable products in less duration of time. Here, We deliver a product with minimal functionalities to the client at an earliest and with every delivery new features and functionality added with the product. This development and testing provide a higher level of customer satisfaction. Testing is NOT a Phase: It is a continuous process. Testing Moves the project: Agile testing provide feedback on an ongoing basis and the product meets the business demands. Everyone Tests: This includes developers and BA’s to test the application except testing team. Shortening Feedback Response Time: In agile for each and every iteration, BA’s are involved. So in this way, continuous feedback shortens the feedback response time and cost involved in fixing is also less. Clean Code: Defects are fixed within the iteration that they found. Test Driven: In agile testing, testing is done while implementation. Before moving forward let’s have an introductory discussion about the agile methodology. SCRUM is an agile development method. It mainly focuses on how to manage tasks within a team-based development environment. Basically, Scrum is derived from the activity that occurs during a rugby match. Scrum believes in empowering the development team. Chartering: In this phase activities like creating teams, preliminary feasibility analysis, developing an initial plan and fine-tuning takes place. the product is delivered to actual users etc. Wrap Up: Post-deployment reviews and reflections are performed in this phase. This method is very useful when the requirements changing frequently from the customer. It provides a frequent release of the product with the checkpoints where user requirement can change or implement easily. So, let’s come to the main point of this blog i.e the tips that make agile testing easy. Teams (Development and Testing teams) are responsible for delivering software that meets the requirements or expected requirements and quality of the client. It is must, to give the knowledge training to the teams to do it right. Testers have that knowledge. By integrating testers into the development teams, teams obtain the skills which they need to test their software. When you try this, make sure you choose the right mix of team, it means that one tester for three programmers is a fair but minimal number. You can never test everything with extensive depth, even in a waterfall project. In an Agile project, all the activities are time-boxed or we can say that we have a time limit on this project. So you have to make choices that how extensively you want to test each feature. You should use a risk-based approach to determine which test activities should be going to carry out for a feature during the iteration. The risk level of every feature is determined by the teams and by the customer as well. It is a very transparent process so that the customer knows exactly which test activities are executed for every feature. For example, Developers tends to test only the success scenario. Testers review the unit tests for all high-risk items and create unit tests that are as good as possible. This review has two advantages. First is It improve the tests or unit tests because testers and developers supplement each other. The developers know about the weaknesses of the source, and the tester can use his knowledge of testing to give tips to improve the unit tests. Another one is the testers know exactly which test cases are executed in the unit tests and can concentrate on executing other test cases (on high-level). There are some issues which are difficult to find but automation testing plays its major role here. Automated testing has a feature like refactoring that helps to introduce problems which can be difficult to find. During the iteration, you can maintain quality levels by using an automated test framework. Testers are able to create new tests easily and quickly in the framework. You can appoint a particular person named as toolsmith that maintains and optimizes the test automation framework. This person will review the new automated tests of the testers and analyzes the daily test results. Almost every software project has a problem automated test results, registration system, and in some cases continuous build results. But how often do team members look at the results or count the open problems? You can install a system in a room and this will show the actual metrics of the currently open problems, % of successful unit tests, % of successful builds, and the current state of the continuous build. The teams are confronted with the information by displaying the metrics in public. The information is no longer just a number in a system or a record with some other information in a metrics database. One of the advantages of having a separate test team is that there is communication improvement between the testers. When you have a project where the testers are distributed across several teams, communication becomes more difficult. To solve this problem, use a test scrum to align the test activities in a proper manner. Test scrum should be held twice a week and every team represented by one tester. 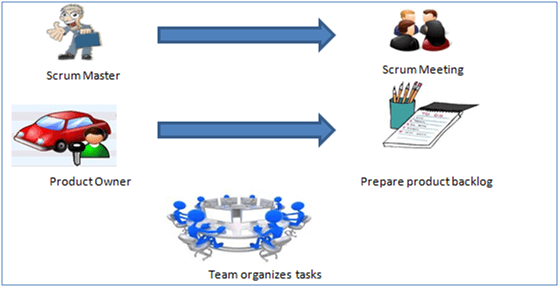 The test scrum is a scrum like the daily team scrum but focused on test activities. The test manager is the ScrumMaster of the test scrum. Every team in a project holds a retrospective meeting that held at the end of the iteration. The team discusses the process and Check that process to find what went well and what went wrong in this retrospective. The testers in the team learn and discover new ways to improve tests. The sharing of knowledge with testers from the other teams helps everyone. The testers can exchange knowledge and experience. They discuss problems which they have with the retrospective. It is important that the retrospective is only related to testing issues. You should not discuss team issues. As with the test scrum, the test manager is the ScrumMaster of the test retrospective. You should try to fix the problems that you find during the iteration in that same iteration. Sometimes you have to end up the iteration with open problems. To add open problems into the sprint backlog for the next iteration is the best way to handle this type of problem. Through explicitly planning the management of this open problem that they are “forgotten” and pile up is very small. When you are going to test an Agile software project you can still use the ‘Traditional’ test techniques. You should use exploratory testing but you need to also apply test techniques such as boundary value analysis, equivalence partitioning, cause/effect diagram, and pair-wise testing. Which test technique you choose for a feature purely depends on its risk category. Exploratory testing used in every category, but if the risk is higher then you should also apply more formal test techniques. Here, a challenge for the tester arises to use a formal test technique without delivering extensive test documentation. The last but the most important tip is to start doing it. There is no need to talk too much about how you are going to introduce testers, or which test approach is perfect for your company/ organization. You are going to make mistakes/ discover that the chosen approach does not fit your company/ organization. The sooner you will start, the sooner you can begin learning and improving your test approaches. With the retrospective meetings, you have an opportunity to adapt your test approach every month. So the time is to conclude the whole content in a brief. Now you have some basic idea of the agile methodology. 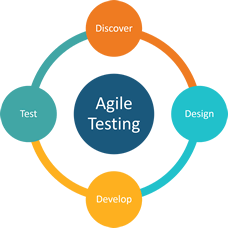 Basically, Agile testing involves testing as early as possible in the software development life cycle. In this testing, customer involvement is very important. The code should be stable todo system testing. An Extensive regression testing can be done to make sure that the bugs are tested and fixed. Communication between the teams makes an agile testing success. Previous articleHow to subscribe to a report or dashboard in Power BI services. Next articleHow To Use Common Controls In Window Form? Sakshi Sharma is a Associate Software Engineer,having six months experience as a software testing trainee,Believe in smart work rather than hard work. Passionate about work. Why it is Better to Invest in Data Processing?